While most restaurants are tightening their belts this season, the One Rochester Group makes headlines once again with yet another new restaurant opening, Botanico at The Garage (“Botanico”), its fourth in the last three to four months. Spanish-born chef de cuisine, Antonio Oviedo, brings with him a wealth of cooking experiences to Botanico, having cut his teeth at rated Spanish restaurants like the one starred Roco Moo by the Roca brothers, two-starred Sant Celoni by the late Santi Santamaria and two-starred Zaranda (where he was pastry chef). Oviedo was also head chef of Binomio (Singapore) from 2012 to 2014 but for Botanico, he has distilled a seasonality-shaped menu of a la carte-only bistro fare for sharing. And best of all, prices are decent. 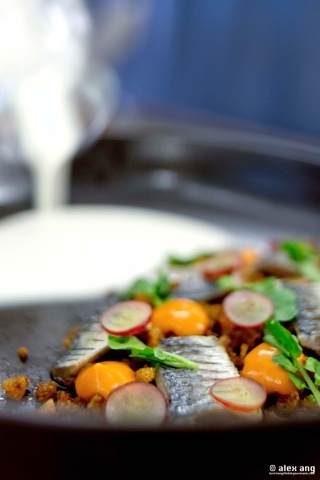 House smoked Japanese sardines (S$20) are sliced, tossed with a mixture of iberico fat-fried croutons, cut Kyoho grapes and chorizo bits, and served in an invigorating, albeit shallow, bath of ajo blanco (chilled blended soup of almond, garlic, olive oil, cucumber and grape). 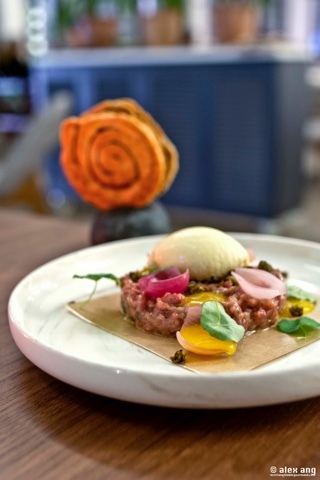 Instead of featuring the all-too-formulaic beef tartare, Australian lamb tartare (S$20) comes to the fore in a yolk cream-bound mound studded with fried capers, vibrant-tasting pickled onions and a crowning glory of mustard ice cream (plus a black olive arlette to boot); a rather bold attempt that pulls off beautifully. Oviedo’s seafood dishes are also brilliant. 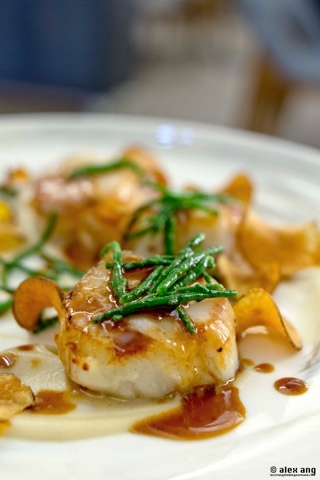 Hokkaido scallops (S$27) flanked by Jerusalem artichoke crisps and puree with melty iberico lardo and salty sprigs of samphire bring together briny, distinctly salty, earthy and savoury flavours with a tad of textures for good measure. The Inka oven-grilled carabinero (S$28 for two) with toasted pine nuts and cubed pig’s trotter terrine is also a delight; the pleasure of tucking into the shrimp’s flesh is only surpassed by the even greater pleasure of emptying the crustacean’s moist and juicy carapace. A hearty serving of saffron-scented mellow rice prepped with the shells of tiger prawn and the carabinero also makes an appearance on the side, its potential only marred by a lack of seasoning. The meats, on the whole, pass muster although dishes like the roasted pigeon (S$27) and chargrilled wagyu flank (S$34) are outshone by the seafood courses. Set in an atmospheric 1920s Art Deco heritage house in the Singapore Botanic Gardens, Botanico sits on the second storey of The Garage, which is named for its function as a parking space for Raffles College professors during its inception. The building also once housed the school of ornamental horticulture and was, at one stage, the office space for the Horticulture Department. 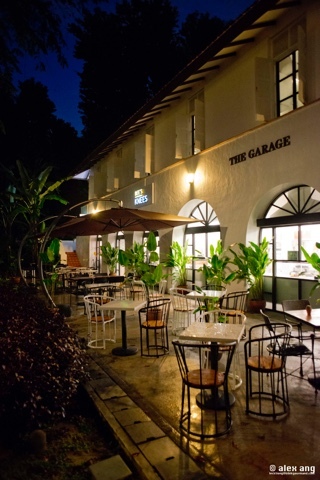 The Garage also houses Bee’s Knees, a café on the ground floor serving coffee, cakes, sandwiches and pizzas. 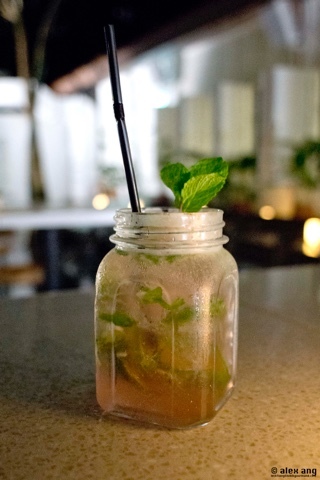 On the second floor, a wood-decked outdoor “hidden bar” that adjoins Botanico also pours reasonably priced cocktails (priced from S$14-S$18) – try the Blackberry Lychee Mojito (S$14). The restaurant’s drinks list features mostly old world wines anchored on Spanish varietals.